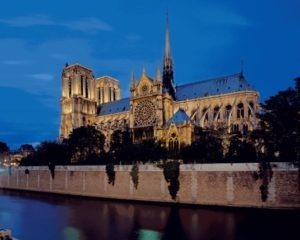 An 850 year old medieval cathedral of Notre-Dame in Paris, one of France’s most famous landmarks, a UNESCO world heritage site that saw 13 million foot fall each year was engulfed in flames. The fire destroyed the buildings spire and roof, however the main structure had been saved. Firefighters were still working to control the blaze, and were trying to save the artwork stored inside the building. The cause of the fire was still not known, French President, Emmanuel Macron called the fire a “terrible tragedy”. The structure was undergoing renovation work after cracks began to appear on the stone, it sparked fears that the structure could become unstable. While the firefighters were fighting the blaze, one firefighter was severely injured. Paris opened an inquiry into for “accidental destruction by fire”. Mr. Macron said the “worst had been avoided” and vowed to launch an international fundraising scheme to rebuild the cathedral. The fire began at 6:30 pm on Monday evening, it quickly reached the roof of the cathedral, destroying its stained-glass windows and the wooden interior before toppling the spire. Thousands of people gathered in the streets around the cathedral, observing the flames in silence. Some could be seen openly weeping, while others sang hymns or said prayers. 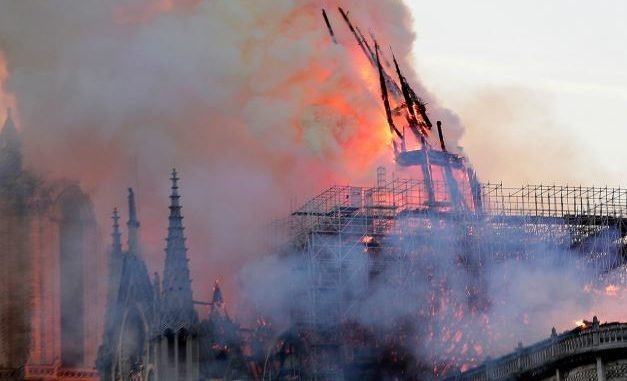 Several churches around Paris rang their bells in response to the blaze, which happened as Catholics celebrate Holy Week. Many European nations stood in solidarity with people of France during the terrible time of tragedy. However, Mr. Trump instead tweeted how Paris should’ve controlled the huge flames. He asked Emmanuel Macron to act quickly, and suggested use of flying water tankers to put out the blaze.